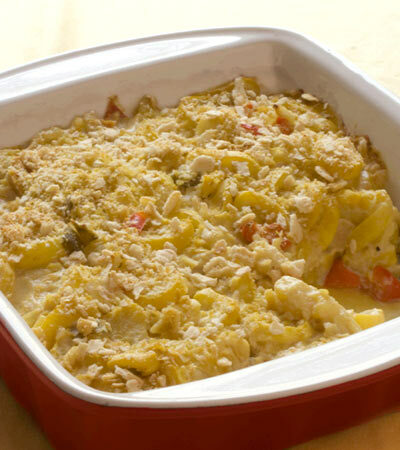 Summer Squash Casserole, a southern favorite made vegan and low fat. 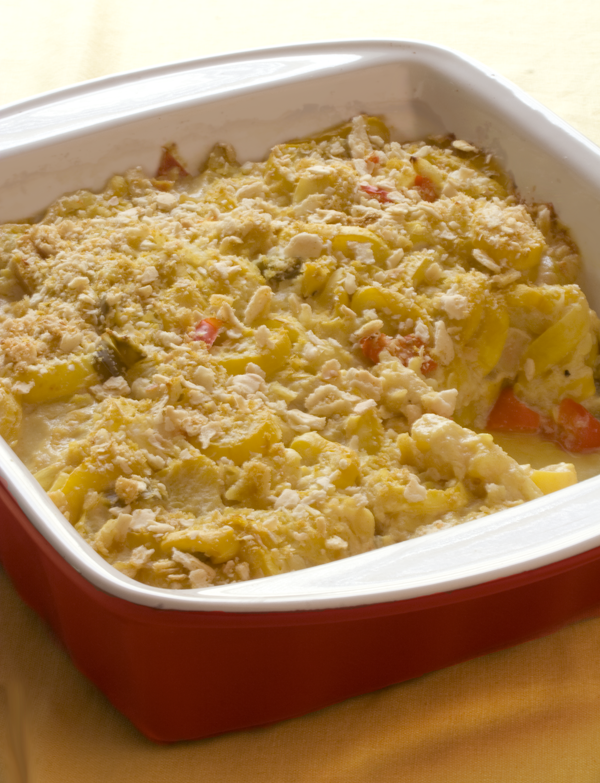 Perfect for using up the summer squash that might be coming from your garden. The sweetness of the squash and bell peppers melds perfectly with the zip of the creamy sour cream. Want to know what others thought about this recipe? Would you like to comment on this recipe? Go to the Summer Squash Casserole blog entry. Place squash, onions, peppers, lemon pepper, salt, sugar and water into a large pot and steam covered for 15 minutes or until tender. Stirring occasionally. While the squash cooks, make the sour cream. Remove squash from heat and drain off excess water. Add 1/2 cup of nutritional yeast and mix together with squash. Then add 1/2 Cup of the sour cream and mix together. Pour mixture into a lightly oiled 2 quart casserole dish. In a small mixing bowl mix together crackers, olive oil and 1 tablespoon of nutritional yeast and sprinkle over the top. Place into oven and bake 20 to 25 minutes. Remove from oven and let rest for about 10 minutes before eating. Use the rest of the sour cream to make creamed potatoes to go with this dish.